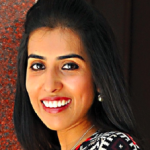 Chytra Anand reviews the combinational treatment options available for melasma, including topical therapies, chemical peels, and lasers. 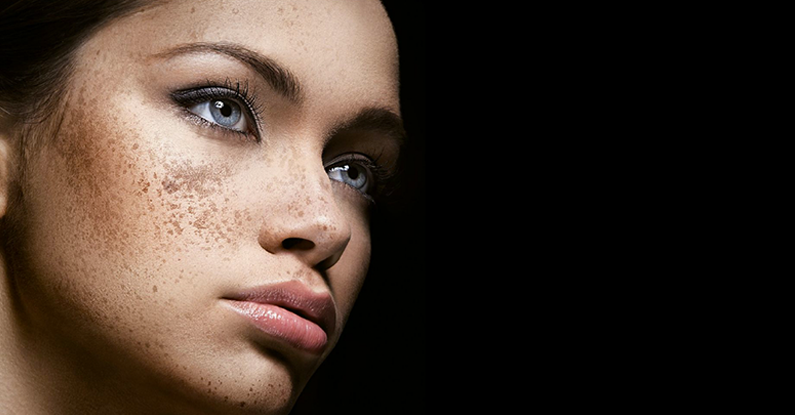 Melasma is a term derived from the Greek word ‘melas’ meaning black . It manifests itself as blotchy, irregularly patterned brown or sometimes grey-brown hypermelanosis of the face, including nose, upper lip, and chin, as well as, on occasion, the neck. It is more common in persons of Hispanic, Oriental, and Indo-Chinese origin1. Women are more often affected than men (female to male ratio, 9:1), and three clinical patterns have been recognized: centrofacial (63% of cases), malar (21%), and mandibular (16%)2–4. Indeterminate type: found in patients with skin type V–VI, according to the Fitzpatrick’s classification5. Contributing factors to melasma include exposure to ultraviolet (UV) light, genetic predisposition5–7, pregnancy8, use of oral contraceptives9, and endocrine dysfunction or hormone treatments10,11. Cosmetics and drugs containing phototoxic agents (e.g. anti-seizure medications) have also been linked to melasma4. The release of melanocyte-stimulating hormone, which can be influenced by stress, suggests that melasma can be stressed-induced in some cases12. Melasma is often a therapeutically challenging disorder to the dermatologist. Therapies have included hypopigmenting phenolic and non-phenolic derivatives, chemical peels, intense pulsed light, and laser therapy13–17. Therapy of melasma is difficult, because of its multifactorial etiology. Topical treatments may temporarily improve the skin, but the condition often returns. The principles of therapy include protection from sunlight, inhibition of the activity of melanocytes, inhibition of the synthesis of melanin, disruption of melanin granules, and removal of melanin18. Sunscreens are defined as physical19 or chemical20 substances designed to protect the structure and function of human skin from actinic damage. Sunscreens with both UV and VL protection could be useful in this condition21. Sunscreens in the VL range usually contain absorbing pigments such as iron oxides. Adding this component to sunscreens such as titanium dioxide and zinc oxide increases their photoprotection capacities, leading to better absorption profiles22. Various systematic agents with protective action against UV spectrum, such as chloroquine, indomethacin, vitamin C, and E, β-carotene, fish oil, and green tea are available for use. These include use of an umbrella, wearing a hat, seeking shade and avoiding peak UVR exposure time19. Hydroquinone has been the gold standard molecule and has been used alone or in combination for over 50 years in the treatment of melasma. It blocks the synthesis of melanin by inhibiting tyrosinase, thereby preventing conversion of DOPA to melanin. It may also inhibit RNA and DNA synthesis, degrade melanosomes and destroy melanocytes23. Typically, 4–6 weeks are required for a visible response; while clearance of melasma may take up to 6 months17. Hydroquinone is available over the counter in some countries at concentrations up to 2%, and as prescription-only preparations at 3% or 4%. Higher strengths are associated with increased incidence of ochronosis, a grey-brown pigmentation that is extremely recalcitrant to treatment24. The most common adverse reactions — mild skin irritation and sensitization, characterized by itching, burning and allergic dermatitis — occur more frequently with 4% than 2% preparations17. Azelaic acid is a naturally occurring dicarboxylic acid synthesized by the yeast Malassezia furfur. It has antiproliferative and cytotoxic effects on melanocytes, a weak inhibitory effect on tyrosinase and is considered to have anti-inflammatory, antibacterial and anti-keratinizing activity25. Azelaic acid is available as a 15–20% cream and has shown efficacy as a monotherapy26. Side-effects are mostly mild, transient itching and burning; however, acneiform eruptions and telangiectasia have also been reported as well as rare cases of asthma, vitiligo, and hypertrichosis27. A combination of azelaic acid 20% cream and glycolic acid 15% or 20% lotion in a clinical comparison with hydroquinone 4% was demonstrated as effective in the treatment of moderate or severe melasma and other facial hyperpigmentation in darker-skinned patients, with only a slightly higher rate of mild local irritation28. Tretinoin is the most widely used retinoid and is thought to act by inhibiting tyrosinase and dispersing keratinocyte pigment granules. It also induces desquamation, thus accelerating turnover in the epidermis and reducing the amount of time cells have to acquire pigment23,24. Tretinoin facilitates the penetration of hydroquinone and counteracts the skin-atrophying effects of the corticosteroid, which in turn appears to antagonize stratum corneum thinning; the presence of tretinoin allows the previously prescribed use of corticosteroids on the face56. Tretinoin is used in concentrations ranging from 0.05% to 0.1% and has been associated with erythema and peeling in the treated area29. Corticosteroids may directly affect melanin synthesis. Although the mechanism by which they lighten skin is not completely known, one possibility is that they alter melanocyte function without killing them, which could explain their short-lived effect30. Corticosteroids are usually combined with other topical agents. Dermatological side-effects, such as perioral dermatitis, rosacea, acneiform eruptions and telangiectasia, can occur, and atrophic changes are commonly encountered31. However, when used with caution, they can be useful to reduce irritation in Hispanic and Asian patients whose skin is especially sensitive23. Kojic acid, a derivative of Aspergillus orzae, inhibits tyrosinase and has shown efficacy in combination with 5% glycolic acid32. Those who do not respond to hydroquinone and glycolic acid, may find the addition of kojic acid beneficial. In an open, comparative, 12-week study, patients received 1% dioic acid cream (twice daily) or 2% hydroquinone cream (twice daily). No signiﬁcant differences were found between the two treatments. The side-effects were similar with both medications; however, pruritus was more common in patients using hydroquinone33. It is an oral anti-thyroid medication which has recently received attention due to its depigmenting effect if used topically. When applied topically, it inhibits melanin synthesis and causes skin depigmentation in lab animals as well as human subjects. It has been successfully tried in humans for the treatment of post-inﬂammatory pigmentation and melasma, with no change in the levels of the thyroid hormones after a 6-week treatment. Application of 5% methimazole cream once daily resulted in signiﬁcant improvement of melasma34. Glycolic acid is an alpha-hydroxy acid that is usually combined with other agents at a concentration of 5–10% for its skin-lightening property. The mechanism of its effect may be due to epidermal remodeling and accelerated desquamation, which would result in quick pigment dispersion on pigmentary lesions. It also directly reduces melanin formation in melanocytes by tyrosinase inhibition35. A randomized controlled trial has demonstrated that a formulation containing 10% glycolic acid and 4% HQ had good clinical efficacy in treating melasma in a group of Hispanic patients. Irritation was a common side-effect, which resolved with the temporary cessation of application and application of moisturizers36. Mequinol (4-hydroxyanisole, hydroquinone monomethyl ether) is a derivative of hydroquinone. Its mechanism of action is unclear; however, being a substrate of tyrosinase, it may act as a competitive inhibitor of the formation of melanin precursors37. It is currently marketed in the USA at a concentration of 2% in combination with 0.01% tretinoin as a penetration enhancer. 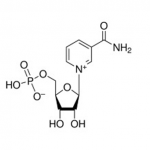 Arbutin, the beta-D-glucopyranoside derivative of hydroquinone, is a naturally occurring plant product which has been used successfully in the treatment of hyperpigmentary disorders. The glycosidic bond is hydrolyzed in vivo leading to the controlled release of hydroquinone. Arbutin acts by the inhibition of tyrosinase, thereby decreasing melanin formation. The normal skin microflora may also hydrolyze arbutin; the hydrolyzed hydroquinone shows more potent free-radical scavenging activity and tyrosinase inhibition than arbutin38. Ascorbic acid has antioxidant properties and affects melanogenesis by reducing dopaquinone to DOPA and preventing free-radical production and absorption of ultraviolet radiation. Comparing the efficacy of 5% ascorbic acid and 4% hydroquinone in 16 patients with melasma in a double-blind clinical trial, the authors concluded that although hydroquinone showed a better response, ascorbic acid may play a role in the therapy of melasma as it is almost devoid of side-effects and it could be used alone or in combination therapy39. Liquorice is the root of the perennial herb Glycyrrhiza glabra. Glabridin is an oil-soluble derivative of liquorice extract. Glabridin has been shown to have tyrosinase inhibitory as well as anti-inflammatory properties in experimental studies. A clinical trial with liquiritin, another liquorice derivative, has also shown benefit in treating melasma40. Tranexamic acid (TA), which is a plasmin-inhibitor hydrophilic drug, classically used as an anti-fibrinolytic agent, has been studied as an alternative for the treatment of melasma41. Recent studies have shown that its topical use prevents UV induced pigmentation in guinea pigs42 and that its intradermal intralesional use produces fast bleaching43. TA blocks plasminogen conversion (present in epidermal basal cells) into plasmin by inhibiting plasminogen activator43,44. Plasminogen activator is generated by keratinocytes and increases the activity of melanocytes in vitro. This substance blockade may be the paracrine mechanism by which TA reduces melasma hyperpigmentation44. A study by Lee et al., in 2006, using only subjective measures to evaluate the efficacy of tranexamic acid injection in melasma treatment, showed a decrease of 42.74% in MASI score after 12 weeks of treatment, and in the patients’ evaluation, 86% of them considered the results as good43. Hydroquinone has often been used in dual-combination therapy with either a retinoid or glycolic acid23. Glycolic acid has also been successfully used in combination with kojic acid32. Mequinol has been used in combination with tretinoin for the treatment of melasma in men13. The most successful combination therapy, however, involves the use of three components that act synergistically and have improved tolerability: hydroquinone, a retinoid, and a corticosteroid45. The original triple combination formula was developed by Kligman and Willis in 1975 and consisted of hydroquinone 5%, tretinoin 0.1%, and dexamethasone 0.1%. Other formulations using different corticosteroids have also shown efficacy (e.g. hydroquinone 5%, tretinoin 0.1% and hydrocortisone 1%)46; however, many of these were unstable and prone to oxidation. The first triple formulation topical therapy to receive Food and Drug Administration (FDA) approval for the treatment of melasma consisted of hydroquinone 4%, tretinoin 0.05%, and the low-potency class VI steroid fluocinolone acetonide 0.01%45. In a study conducted to evaluate the efficacy and safety of oral tranexamic acid (TA) in the treatment of melasma, a dose of 250 mg oral TA b.i.d for 6 months was given along with topical sunscreen. Patient outcomes were rated as follows: 15 patients (23%) excellent, 41 (63%) good, 8 (12%) fair, and 1 (1.5%) poor, respectively. Six month follow-up results after completion of treatment revealed no recurrence in 57 patients (87%). None of the patients had serious systemic side-effects, only a few had oligomenorrhoea, palpitation, and gastric upset47. Chemical peels used in melasma include agents such as glycolic acid, trichloroacetic acid, Jessner’s solution, salicylic acid48, tretinoin, and kojic acid17,49–52. A series of ﬁve salicylic acid (SA) peels at concentrations of 20–30% plus hydroquinone at 2-week intervals were found to be effective in darker skinned (V–VI) patients. The treatment was well tolerated53. 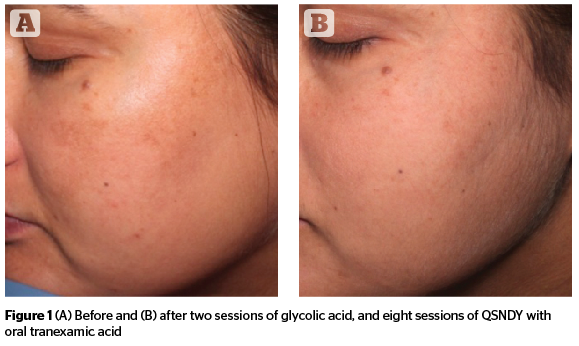 Serial glycolic acid (GA) peels (from 35–50% to 70% every second peel) plus combination topical therapy (azelaic acid and adapalene) were studied in 28 women with melasma. Better results were found in the group receiving chemical peels plus topical therapy at GA concentration 50% or higher54. GA peels in concentrations of 20–70% administered every 3 weeks were studied alone or in combination with a topical regimen of hydroquinone plus 10% GA in 10 Asian women55. However, the results in the two groups were not signiﬁcantly different, combination being more effective. In one study, 55 to 75% GA was compared with 10–15% trichloroacetic acid (TCA) peels in 100 patients with recalcitrant melasma. The time to response and degree of response were more favorable with TCA when compared with GA; however, relapse was more common in the former group (25 vs. 5.9% in the GA group); 20% TCA peels plus topical 5% ascorbic acid was found to be superior to TCA peeling alone in 30 women with epidermal melasma56. Fifty percent solution of resorcinol was found to be effective in patients with melasma and skin types I–IV30. In a split-face trial, pure lactic acid full strength (92%, pH 3.5) was compared with Jessner’s solution. All patients showed marked improvement as calculated by MASI score before and after treatment, and the response was statistically signiﬁcant. No side-effect was recorded in all treated patients57. Its efﬁcacy in melasma was compared with GA peel. There was no statistically signiﬁcant difference between the two. There was an overall decrease in MASI of 63%16. Serial 1% tretinoin peels have claimed to be as effective as 70% GA for melasma in dark skinned individuals15. It is an α-keto acid. The efﬁcacy and tolerability of 50% pyruvic acid was assessed for the treatment of photodamage, superﬁcial scarring, and melasma. Twenty subjects entered the study. Four peeling sessions were performed once every 2 weeks. The peel was shown to be safe and effective to treat photodamage, melasma, and superﬁcial scarring, allowing the patients to carry out their working life regularly as well as their social life58. It may be performed in recalcitrant cases, but post‑inﬂammatory hyperpigmentation may occur in Asian and dark skin. This side-effect may be avoided by the use of the micro-dermabrasion technique. Micro-dermabrasion alone or in combination with 15% trichloroacetic acid (TCA), has been found to be an effective, well tolerated treatment for cutaneous hyperpigmentation59. Lasers act by disrupting melanin granules in the upper dermis, which are subsequently engulfed by macrophages18. These have been used in the treatment of hyper-pigmentary disorders, such as solar lentigines, lentiginous nevi, café- au-lait macules, and melasma60–63. The use of laser therapy is recommended only for refractory melasma64. Furthermore, the recent introduction of intense pulsed light (IPL) skin rejuvenation using relatively shorter wavelengths and pulse has brought about signiﬁcant macroscopic and quantitative improvements, especially, in the treatment of epidermal pigmentation and improvement of basic skin tone65. Side-effects of laser therapy include atrophy, hypertrophic scarring, hypopigmentation, and hyperpigmentation. Low ﬂuence Q-switched Nd:YAG Laser66 (QSNYL) has been used in recent years. ‘Laser toning’ using a low ﬂuence, large spot size, multiple passed Q-switched 1064nm Nd:YAG laser has gained much popularity in Asian countries for non-ablative skin rejuvenation and the treatment of melasma67. Low-dose 1064 nm QSNYL can lead to sub-lethal injury to melanosomes in the melanocytes and, as a result, melanin granules will be fragmented and dispersed into the cytoplasm68–71. The low-dose QSNYL at 1064 nm, a wavelength well absorbed by melanin relative to other optically absorbing structures in skin, causes highly selective destruction of melanosomes68,72. The total accumulative dose may be lower than total toxic accumulative energy that will destroy cells and this will lead to lightening of the melasma. In a study performed to observe the effect of low-dose 1064 nm QSNYL on melasma, 20 melasma patients were treated with 1064 nm QSNYL at ﬂuences of 2.0–3.5 J/cm2, which was used to treat the whole face, including the melasma lesions. The treatment was performed ﬁve times with a 1-week interval, there was a statistically significant decrease in melanin index in the melasma lesional skin ( p<0.001)73. In another study, the efﬁcacy of a 1064 nm Q-switched Nd:YAG laser with low pulse energy in the treatment of melasma in 25 women was assessed by retrospective analysis. Eleven of the 25 patients (44%) had marked clinical improvement: 7 of these (28%) had near-total clinical improvement, 5 had moderate clinical improvement, and 2 had minimal to no improvement. It was concluded that the use of a Q-switched Nd:YAG laser with low pulse energy is an effective, easily performed treatment for melasma74. Non-ablative fractional photothermolysis (NFP) has been used as a treatment for melasma with conﬂicting results75–80. Indeed, the ﬁrst clinical studies reported signiﬁcant improvement in melasma with this laser76,77 and were corroborated by the decrease in melanocytes compared to the pre-treatment specimens78. It is, however, recommended to be used judiciously, in view of unacceptable side-effects. The efﬁcacy and safety of non-ablative 1550 nm fractional laser therapy was assessed and results were compared with those obtained with triple combination therapy in 20 female patients with moderate to severe melasma and Fitzpatrick skin types II–V. The randomized controlled observer blinded study was conducted over an 8-week period. The mean treatment satisfaction and recommendation were signiﬁcantly higher in the laser group at 3 weeks. However, melasma recurred in ﬁve patients in both groups after 6 months. Side-effects in the laser group were erythema, burning sensation, facial edema, and pain; whereas in the triple group, side-effects were erythema, burning, and scaling79,80. Intense pulsed light (IPL), can be used to treat various clinical conditions including melasma. IPL emits a broad spectrum of light from 500 nm up to 1200 nm with a long pulse width of milliseconds, unlike other conventional pigment-targeting lasers. Its emitting spectrum includes light absorbable to all of the skin chromophores (melanin, hemoglobin, and water) and thus, it was accepted that IPL could solve every cosmetic issue very successfully. However, IPL was found to be effective in clearing epidermal pigmentary and vascular issues but not satisfactory enough in mixed or dermal type melasma81. Some investigators even reported the experience of subtle melasma occurring after IPL treatment82. In a study conducted to evaluate the effectiveness of intense pulsed light (IPL) in melasma, it was concluded that a single session of IPL combined with stable ﬁxed-dose triple combination treatment is a safe and effective treatment for refractory mixed and dermal melasma83. In another study to evaluate the clinical effects and safety of combinational treatment using intense pulsed light and low ﬂuence Q-switched Nd:YAG laser, over laser treatment alone, it was concluded that, combination treatment may provide more rapid clinical resolution in mixed type melasma with possible long-term clinical beneﬁts84. The combination of lasers can be beneficial for enhancing efficacy and patient satisfaction. 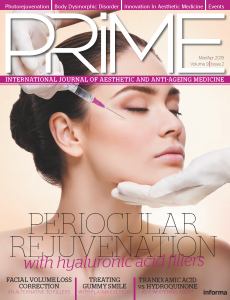 A pilot study investigating the efficacy of a combination of lasers by Nouri et al., showed that in an open trial on four patients of pulsed CO2 followed by Alexandrite laser, all had complete resolution without hyperpigmentation or scarring85. This may be explained by destruction of melanocytes by pulsed CO2 and then elimination of dermal melanin by Alexandrite laser. In an open interventional trial by Wang and Liu, 66% of the 32 patients, treated with combination of Q-switched Nd:Yag and alexandrite laser, showed more than 90% improvement after 4–15 sessions, and none of the patients reported any complications86. 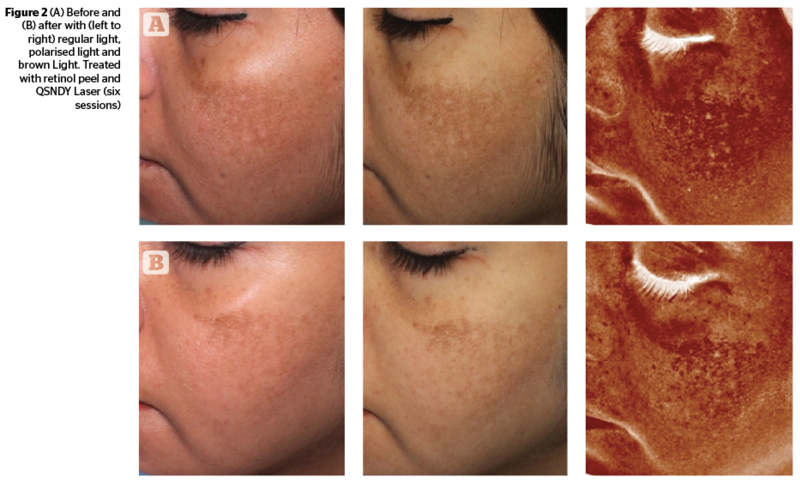 This study also highlighted that duration (>2 years being more resistant) and color (light brown responding more favorably) of melasma affects the response to therapy. Not only does a combination of lasers but also topical therapy in combination with lasers leads to an improved efficacy and sustained effects, as shown by Trelles et al., in a randomized, comparative trial on 30 melasma patients who were allocated into three groups; with the first and second group receiving either topical therapy or lasers, and third group receiving both. The satisfaction index and reduction in MASI was 100% in all the 3 groups at the end of 1 month, but, only in the third group, the results were maintained and MASI scoring at 6 and 12 months was significantly better than either of the 2 groups (P<0.001)87. In a randomized, double bind, placebo-controlled trial, a combination of oral proanthocyanidin plus vitamin A, C, and E was assessed in 60 Phillipino females with bilateral epidermal melasma. The antioxidants were taken twice daily for 8 weeks88. There was significant reduction in MASI scores (P=0.001)) over the malar area. The combination was also well-tolerated. Pycnogenol, a standardized plant extract, obtained from the bark of the French maritime pine Pinus pinaster, has evoked great interest in the management of melasma. Between 65% and 75% of pycnogenol are procyanidins, comprising of catechin and epicatechin subunits with varying chain lengths. It also has antioxidant and anti-inflammatory properties as it doubles the intracellular synthesis of anti-oxidative enzymes and scavenges free radicals due to the aromatic rings bearing one or more hydroxyl groups. It also causes regeneration and protection of vitamin C and E.
A clinical study on efficacy of pycnogenol in 30 melasma patients by Ni et al., showed a decrease in pigmentary intensity (P<0.001) and melasma area index (P<0.001) with 75 mg daily oral intake (25 mg three times a day) of pycnogenol for a total of 30 days in 80% of the patients89. The quest of finding newer depigmenting agents for melasma has shifted to the molecular and DNA level. Antisense oligonucleotides (ASOs), which modulate the synthesis of key enzymes of melanogenesis, namely tyrosinase, TRP1 and TRP2 by interacting with targeted mRNA at a translational level, have also been investigated for their in vivo and in vitro depigmenting effects90. A randomized-controlled trial was conducted on 30 Asian women with pigmented spots, and the formulation was applied twice daily for 8 weeks on pigmented and non-pigmented skin, which showed the lightening effect produced by the formulation to be significant (P < 0.05) in both the pigmented and non-pigmented skin as assessed by objective parameters90. Thus, these antisense nucleotides are a new generation of active cosmetic ingredients with safety and stability, which can be utilized in melasma. The Pigmentary Disorders Academy (PDA) undertook to evaluate the clinical efficacy of the different treatments of melasma in order to generate a consensus statement on its management. The consensus of the group was that first-line therapy for melasma should consist of effective topical therapies, mainly fixed triple combinations. Where patients have either sensitivity to the ingredients or a triple combination therapy is unavailable, other compounds with dual ingredients (hydroquinone plus glycolic acid) or single agents (4% hydroquinone, 0.1% retinoic acid, or 20% azelaic acid) may be considered as an alternative. In patients who failed to respond to therapy, options for second-line therapy include peels either alone or in combination with topical therapy. Some patients will require therapy to maintain remission status and a combination of topical therapies should be considered. Lasers should rarely be used in the treatment of melasma and, if applied, skin type should be taken into account91. The management of melasma is challenging and requires a long-term treatment plan, multimodality approach and maintenance therapy. Khunger N, Sarkar R, Jain R. Tretinoin peels versus glycolic acid peels in the treatment of melasma in dark skinned patients. Dermatol Surg. 2004;30:756–60. Draelos ZD. Cosmetic therapy. In: Wolverton SE, editor. Comprehensive Dermatologic Drug Therapy. 2nd ed. Philadelphia: Saunders; 2007. pp. 761–74. Sharquie KE, Al-Tikreety MM, Al-Mashhadani SA. Lactic acid chemical peels as a new therapeutic modality in melasma in comparison to Jessner’s solution chemical peels. Dermatol Surg. 2006;32:1429– 1436. Goldberg DJ, Berlin AL, Phelps R. Histologic and ultrastructural analysis of melasma after fractional resurfacing. Lasers Surg Med. 2008;40:134–138. Wang HW, Liu KY. Efficacy and safety of low energy QS Nd Yag and QS Alexandrite laser for melasma. Zhongguo Yi Xue Ke Xue Yuan Xue Bao 2009;31:45-7.